We are incredibly excited to announce that Equiparts is featured in the Spring 2016 issue of Plumbing Advocate Magazine! 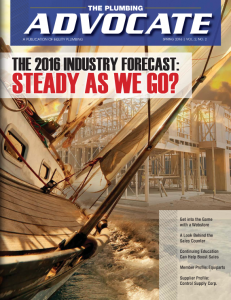 Plumbing Advocate Magazine, which is a division of Equity Plumbing, shares industry and advertising space for plumbing and associated industry suppliers to reach plumbing wholesalers. 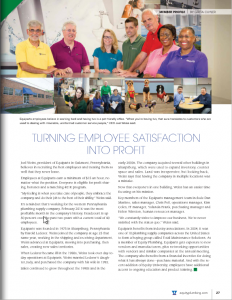 This quarter, the magazine chose Equiparts as the featured Member Profile and we couldn’t be more excited to share it with you! In the article, you will find some truly interesting insights. Joel Weiss, Equiparts President, delves into some pretty specific tidbits of information that demonstrates why there is such a high level of employee satisfaction found throughout the team. Did you know that all employees at Equiparts, no matter the position, are eligible for profit sharing, bonuses, and a matching 401K program? It’s true. That and more. This employee satisfaction translates into a strong customer service team that truly cares about our company, our products, and our customers’ satisfaction. Read the full article here: ‘Turning Employee Satisfaction into Profit‘. Be sure to tell us your favorite part of the article in the comments below! Would you like to work for or with a company like Equiparts? We want to hear from you! Follow us on social media to join the conversation with Equiparts and find out about more Company news, product tip videos, and current specials! For those of you who aren’t familiar with Equiparts, we are repair parts specialists. We supply a complete line of plumbing and mechanical specialties to solve a wide variety of maintenance repair problems. Take a look at the products we supply, and keep in mind, if you ever need a hard to find part, call Equiparts!